Jurien Bay, is a coastal town in the Wheatbelt region of Western Australia, 220km north of Perth facing the Indian Ocean.HistoryThe coastline around Jurien Bay was first known to Europeans in the 17th century. Kick off your visit on the 1st (Fri): get interesting insight from Tours and then identify plant and animal life at Sandy Cape Recreation Park. To find where to stay, traveler tips, reviews, and more tourist information, read our Jurien Bay road trip planning tool . Calgary, Canada to Jurien Bay is an approximately 30-hour flight. You'll lose 15 hours traveling from Calgary to Jurien Bay due to the time zone difference. Wrap up your sightseeing on the 1st (Fri) early enough to travel to Geraldton. Geraldton is a coastal city in the Mid West region of Western Australia, located 424km north of Perth.At June 2015 Geraldton had an estimated urban population of 39,825. 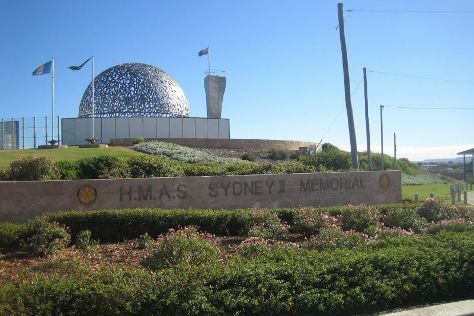 Start off your visit on the 2nd (Sat): browse the exhibits of HMAS Sydney II Memorial, then pause for some serene contemplation at St Francis Xavier Cathedral, then identify plant and animal life at Coalseam Conservation Park, and finally tour the pleasant surroundings at Town Beach. To see photos, traveler tips, ratings, and more tourist information, read Geraldton vacation planner . Getting from Jurien Bay to Geraldton by car takes about 2.5 hours. March in Geraldton sees daily highs of 36°C and lows of 20°C at night. Finish your sightseeing early on the 2nd (Sat) to allow enough time to drive to Kalbarri. On the 3rd (Sun), explore the activities along Blue Holes, then look for all kinds of wild species at Kalbarri Pelican Feeding, then contemplate the waterfront views at Murchison River, and finally tour the pleasant surroundings at Chinaman's Beach. On the next day, explore the striking landscape at Eagle Gorge, explore the wealth of natural beauty at Ross Graham Lookout, then take a tour by water with Boat Tours & Water Sports, and finally take in the dramatic natural features at Island Rock & Natural Bridge. To find where to stay, photos, more things to do, and more tourist information, read our Kalbarri road trip planning site . You can drive from Geraldton to Kalbarri in 2 hours. Another option is to do a combination of bus and taxi. Finish your sightseeing early on the 4th (Mon) so you can drive to Coral Bay. Coral Bay is a small town on the coast of Western Australia, north of Perth. On the 5th (Tue), see some colorful creatures with a scuba or snorkeling tour and then identify plant and animal life at Ningaloo Marine Park. For more things to do, traveler tips, maps, and more tourist information, you can read our Coral Bay trip itinerary planning website . Getting from Kalbarri to Coral Bay by car takes about 7 hours. Other options: take a bus; or do a combination of bus and flight. Finish your sightseeing early on the 5th (Tue) to allow enough time to travel back home.